Happy New Year! I wish you and your family a peaceful and prosperous 2015. This year brings much change to the Commonwealth. A new governor will have to work with the General Assembly to craft solutions to the ongoing fiscal challenges. I’m confident we can do it if we put politics aside and work for the people we represent. 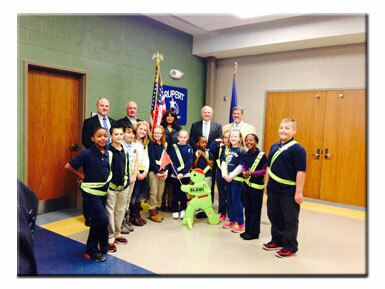 Senator Mensch, Pottstown Borough officials, and Pottstown School District officials gathered for a press conference to announce the borough receiving $300,000 in federal funds for a comprehensive walking and bicycling network enabling 3,000 students to walk or bicycle safely to school. The project will also allow adults of all ages to walk or bike leisurely between neighboring municipalities. This edition of the Mensch Report features my annual Senator for a Day event which was held at the Montgomery County Community College – Pottstown Campus, South Hall. 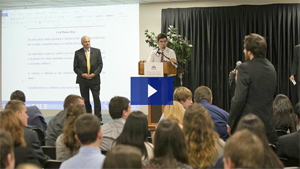 This seminar allowed students the opportunity to role play as a State Senator in a mock legislative session. Students from the various high schools within the 24th District selected a committee based on their area of interest and debated and discussed the mock legislation that had been presented to them. Various lobbyists and legislative staff were on hand to guide the students through the committee process and assist them as needed. After the students discussed the legislation before their committees, a general session commenced, at which time all students voted on all of the legislation voted out of committee. Students from Brandywine Heights, Christopher Dock, North Penn, Palisades, Pottsgrove, Pottstown, and Souderton Area school districts attended the event, resulting in an impressive turnout of 80 students. Every year I am impressed with students’ enthusiasm to participate in this event. The feedback from the teachers is always positive and students continue their discussion about the event at home and in their classes. You can view this and every edition of our TV program here. PennDOT and the Pennsylvania State Police urge motorists to “steer clear” of police, emergency responders, road crews and tow-truck operators while they carry out their duties. Pennsylvania’s Steer Clear Law requires motorists to move to a lane that is not immediately adjacent to an emergency response area. Such areas include locations where police are making traffic stops, where highway or construction workers are involved in emergency assistance, or where tow trucks are responding to disabled vehicles. If drivers cannot move over because of traffic or other conditions, they must proceed at a speed that is “reasonable and prudent,” according to the law. The law applies any time an emergency vehicle has its lights flashing and where road crews or emergency personnel have lighted flares or have posted signs or other traffic control devices. Failure to move over or slow down can result in a summary offense that carries a fine of up to $250. In addition, fines will be doubled for other traffic violations occurring in these areas. If the violation leads to a first responder being injured, a 90-day license suspension could result. Pennsylvania is proud to host the 99th Annual Farm Show which is the largest indoor agricultural event in the nation. The eight-day show at the Pennsylvania Farm Show Complex and Expo Center will feature 6,000 animals, 10,000 competitive exhibits and 300 commercial exhibitors. The Pennsylvania Farm Show runs January 10 - 17 from 8 a.m. to 9 p.m. Admission is free and parking is $10. The Pennsylvania Farm Show Complex and Expo Center is easily accessed from nearby Interstate 81. For a complete schedule of Farm Show events visit www.farmshow.state.pa.us. Legislation passed last year authorized PennDOT to produce new license plate designs, one of which serves as a testament to the American spirit. The plate, authorized by Act 109 of 2014, is called the “In God We Trust” specialty plate and depicts the image of the symbol of America – the bald eagle – with the words “In God We Trust” beneath it. The fee for this plate is $20, plus registration fees if they are due. These plates may also be personalized for an additional $100. To order the “In God We Trust” specialty plate, or to learn more about a wide variety of license plates, visit our website at www.dmv.state.pa.us and click on Motor Vehicle Information then Specialty Plates under Registration Plate Information. The plates normally take two to four weeks to deliver; for personalized plates, allow eight to 10 weeks for delivery. Senator Mensch congratulated Synergis Technologies, LLC on their new opening at the Best Made Center in Quakertown. 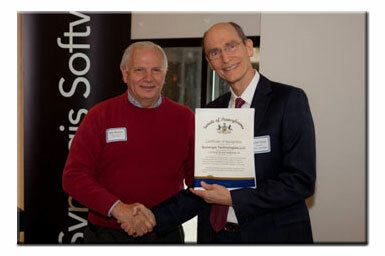 The Senator presented company officials with a certificate of recognition and emphasized that the community was fortunate to have Synergis Technologies, a growing U.S.-based software and engineering design business, choose the Quakertown community as one of its locations. They will undoubtedly bring prosperity and growth to the surrounding area and the business community. In-hospital mortality rates decreased significantly statewide between 2008 and 2013 for eight of 16 illnesses reported in the 2013 Hospital Performance Report from the Pennsylvania Health Care Cost Containment Council (PHC4). PHC4 is an independent state agency that collects, analyzes and reports information that can be used to improve the quality and restrain the cost of health care in the state. The 2013 Hospital Performance Report evaluates hospitals in the commonwealth on 17 medical conditions and surgical procedures. It contains hospital-specific information about volume of cases, mortality, readmissions and patient charges. You can access the report and review statewide statistics, as well as those for hospitals in the southeastern region (including Bucks and Montgomery counties) here. You can search for aid by business, community or local government incentives, as well as the individual categories, to find the right tool for you.